On her wedding day, the bride is the centre of attraction, which makes all the guests and people notice every detail about her. Be it her dress, her jewellery, her makeup, or her mehendi among many others. The jewellery plays a very important role in the overall look of the bride, making its choice very difficult. Hindu traditions prescribe the ‘Solah Shringar’ or 16 adornments for the Indian bride to achieve the most exquisite and feminine look on her wedding day. Of course, this cannot be achieved with the dress alone, making the jewellery a must to make a statement. So, have a look at some of these essential bridal jewellery accessories to complete your bridal look. 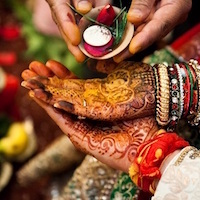 Earlier women used to get their nose pierced to wear a nath, but with the availability of clipped on nose rings, it makes it easier for the modern bride. Nath gives a really elegant look and is essential for bridal jewellery accessories. Another traditional accessory, maang tika is worn on the hair and is visible across the forehead. It’s a beautiful piece of jewellery and makes a bride look gorgeous after she drapes the ghunghatt over her head. Bridal earrings are heavy, dangling jhumkas that match the overall jewellery worn by the bride. Earlier they were dome-shaped but with the changing trends, chandelier style of earrings is in fashion. Kunda, semi-precious or precious stones are beautiful choices for earrings. 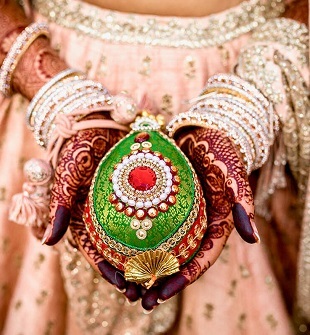 Make your mehendi coloured hands even more beautiful by accessorising them with rings. You can go with haathphool which not only have rings but also overs your hands and wrists beautifully. The most important part of bridal jewellery is the neckpiece. Nowadays, a lot of designs in gold, diamond, kundan, semi-precious stones etc. are available to choose from. You can mix and match neck pieces with chokers, raani haar among others and get that perfect Indian Bridal Jewellery. Your feet deserve the decoration too, making it one of the most important bridal jewellery accessories. For this, you can go for anklets and toe rings. Heavy anklets with small rings will make your feet even more beautiful, enhancing your overall look. Accessories are extremely important for a groom as well to look like the king on his wedding day. 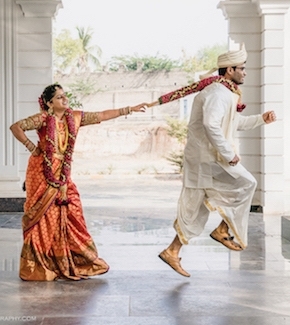 There are a number of accessories a groom can go for. Most important is the Kalgi to be worn on the turban. The outfit can be accompanied by a necklace which can be made of pearls or semi-precious stones. Along with that, a groom can also go for cuff links and juti matching his sherwani and a stylish watch to complete the royal look. Let us know about more bridal jewellery accessories in the comment section below!